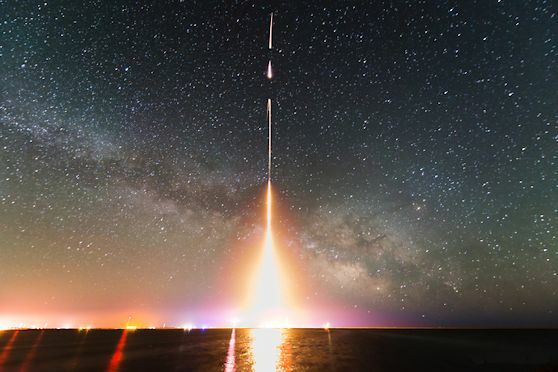 Nov 6, 2014: A NASA sounding rocket experiment has detected a surprising surplus of infrared light in the dark space between galaxies, a diffuse cosmic glow as bright as all known galaxies combined. The glow is thought to be from orphaned stars flung out of galaxies. "We think stars are being scattered out into space during galaxy collisions," said Michael Zemcov, lead author of a new paper describing the results from the rocket project and an astronomer at the California Institute of Technology (Caltech) and NASA's Jet Propulsion Laboratory (JPL) in Pasadena, California. "While we have previously observed cases where stars are flung from galaxies in a tidal stream, our new measurement implies this process is widespread." During the CIBER flights, the cameras launch into space, then snap pictures for about seven minutes before transmitting the data back to Earth. Scientists masked out bright stars and galaxies from the pictures and carefully ruled out any light coming from more local sources, such as our own Milky Way galaxy. What's left is a map showing fluctuations in the remaining infrared background light, with splotches that are much bigger than individual galaxies. 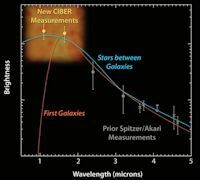 The brightness of these fluctuations allows scientists to measure the total amount of background light. "The light looks too bright and too blue to be coming from the first generation of galaxies," said James Bock, principal investigator of the CIBER project from Caltech and JPL. "The simplest explanation, which best explains the measurements, is that many stars have been ripped from their galactic birthplace, and that the stripped stars emit on average about as much light as the galaxies themselves." Caltech manages JPL for NASA. The work was supported by NASA, with initial support provided by JPL's Director's Research and Development Fund. Japanese participation in CIBER was supported by the Japan Society for the Promotion of Science and the Ministry of Education, Culture, Sports, Science and Technology. Korean participation in CIBER was supported by the Korean Astronomy and Space Science Institute."